Wyandotte County – Page 1537 – Welcome to Wyandotte Daily! The Presidents Day forecast is mostly sunny skies, with a high near 53, the National Weather Service said. There will be a warming trend this week, with temperatures hitting a top near 70 on Thursday. Tonight, there is a 30 percent chance of rain, mainly before 2 a.m., according to the weather service, with a low of 39. 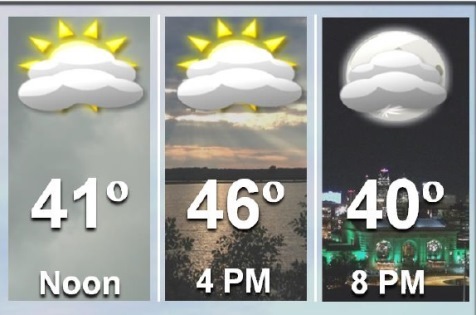 Look for Tuesday’s top temperature to be 48, with mostly sunny skies, the weather service said. There will be a north northwest wind of 10 to 18 mph gusting as high as 28 mph. Tuesday night, the low will be 31, with a north northwest wind of 5 to 8 mph, according to the weather service. Wednesday’s weather will be mostly sunny with a high near 59, the weather service said. Wednesday night, the low will be around 38. Thursday, expect mostly sunny skies and a high near 70, according to the weather service. Thursday night’s low will be 63. Friday’s forecast is sunny with a high of 67, the weather service said. Friday night, the low will be around 40. Saturday, the high will be near 63 with mostly sunny skies, according to the weather service. Valentine’s Day saw a warmup from very cold temperatures in the early morning to mid-40s in the afternoon. Temperatures were 46 degrees at 1 p.m. in Wyandotte County, according to the National Weather Service. Spring-like temperatures are expected later this week as highs will approach 70 degrees on Thursday, the weather service said. Tonight, expect a low of 32, according to the weather service. On Monday, Presidents Day, there will be a high of 54 with mostly sunny skies. Monday night, there will be a 30 percent chance of rain after midnight, according to the weather service, with a low of 38. Tuesday, expect a high near 52 and mostly sunny skies, with a northwest wind of 10 to 16 mph gusting to as high as 24 mph, the weather service said. Tuesday night’s low will be around 31. Wednesday’s high is expected to be near 56, the weather service said. Wednesday night’s low will be around 38. Thursday, it will be mostly sunny with a high near 67, according to the weather service. Thursday night’s low will be around 55. On Friday, the high will be about 67, and on Friday night, the low will be about 39, according to the weather service.